After sixteen years of designing and manufacturing the world’s best selling bi-optic scanner, Datalogic Scanning proudly celebrated the completed production of its one millionth Magellan bi-optic scanner on April 30th, 2010. As the scanner rolled off the production line at Datalogic’s headquarters in Eugene, Oregon, USA, it greeted a crowd of elated employees who understood what this milestone means for not only Datalogic, but for its customers and the AIDC industry as a whole. In 1994, the world was introduced to the first Magellan bi-optic scanner, named after the explorer whose expedition was the first to circle the globe, Ferdinand Magellan. The Magellan scanner was the industry’s first scanner with 360-degree scanning technology, setting the stage for remarkable POS innovation across the retail supermarket segment. The production of the one millionth Magellan scanner is a significant accomplishment for the Automatic Identification and Data Capture (AIDC) industry because Magellan bi-optic scanners have continued to provide a platform for technological growth for the entire industry. According to Matt Schler, General Manager of Datalogic Scanning Fixed Retail, “Today, we share this milestone with our many customers around the world. Without their on-going support and feedback, this significant milestone would not be possible. ” Both Bill Parnell and Matt Schler were on the program team for the original Magellan bi-optic scanner. “We feel like every Magellan bi-optic scanner helps our customers be more productive while improving their customers’ shopping experience by shortening the time spent in line at the checkout. It’s the simple fundamental value of saving people time that is at the heart of our longevity,” added Parnell. Why was the scanner named “Magellan”? The world’s first 360-degree bar code scanner was named after Ferdinand Magellan, a Portuguese captain under the sponsorship of the king of Spain, who needed to find a new route to Asia. In 1522, his crew became the first ever to complete a 360-degree voyage around the world, an incredible feat and milestone in history. Emulating this “first-ever” history, “Magellan” was chosen as the scanner’s name because it was the world’s first 360-degree bar code scanner. When was the Magellan bi-optic scanner created? The idea for the Magellan bi-optic scanner came to Spectra-Physics engineers after a request from an end-user customer in 1993 for an improved checkout process. Following a collaborative effort between Spectra-Physics and IBM, the first Magellan scanner hit the marketplace by May 1994. The introduction of this scanner was incredible in itself as it typically takes many years for a product to move from concept to launch. Spectra-Physics was a leader in the AIDC industry at the time, and the company was later purchased by PSC, which is now, of course, Datalogic Scanning. What was the project code name for the Magellan scanner during its design? The project code name for the first Magellan scanner was “XYZ.” Although seemingly unoriginal, the code was actually carefully chosen to represent three different products at the time. The X, as in the Cartesian coordinate system where X is the horizontal access, became the product, HS1250. The Y, or the vertical access, became the product, VS1200. And finally, the Z became The Magellan Scanner as this third dimension represented the scanner’s 360-degree scanning capabilities. 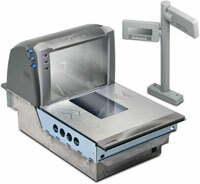 Who was the first company to install the original Magellan Scanner? The first beta site was at a Safeway grocery store in Eugene, Oregon. The site launched on March 24, 1994 and was the perfect testing ground as Eugene was the hometown for Spectra-Physics and, now, the headquarters for Datalogic Scanning. Two additional beta sites launched in mid-1994 at The Great Atlantic & Pacific Tea Company (A&P) in Sussex, New Jersey and Ralph’s in Los Angeles, California. Our first true Magellan customer was A&P. How many scan lines are generated each second by a Magellan scanner? On average, Magellan scanners generate 2,381,400,000 scan lines each second of every day around the world. What distinguishing feature separated the Magellan from any other retail scanner in the marketplace at its introduction? The Magellan scanner features the industry’s first trapezoidal horizontal window, which enabled the scanner to have true 360-degree scanning coverage. In 1994, this window was a groundbreaking design, utilizing the checker’s “read-back” scan pattern technology to create total coverage scanning.